All the expertise you need in one place. That’s the Solutions Advisors Group. From marketing and sales expertise, to management and operations. Solutions Advisors Group provides innovative solutions to the increasingly complex mature market. Melding the forces of Solutions Advisors and Solvere Living, Solutions Advisors Group creates a consulting powerhouse to deliver marketing, branding, strategy, leadership development and management expertise to senior living organizations nationwide. 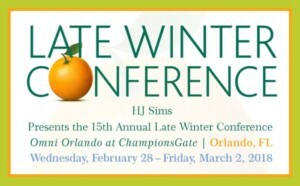 David Canavan and Kristin Kutac Ward will be attending the HJ Sims conference at the Omni Orlando at ChampionsGate from February 28 through March 2. Emily comes to Solutions Advisors with a background in non-profit communications and digital marketing focusing on website development and management, social media and brand management. At Solutions Advisors, she focuses on digital project management for consulting clients facilitating new web development projects and email marketing, updating website content and managing clients’ social media accounts including Facebook advertising. Karen has over 18 years of strategic marketing and account management experience. Before joining Solutions Advisors, she worked in a variety of industries including non-profit, medical, financial and paper and packaging. She brings all the skills and experience from her previous positions to Solutions Advisors, where she is dedicated to anticipating and fulfilling her client’s needs. Karen focuses on the creation and management of their marketing campaigns through the development of effective creatives and applying the results of marketing analytics. Records are made to be broken. At Fox Hill, a condominium independent living community in Bethesda, Maryland, the sales team shattered any previous records by ending 2017 with a total of 47 sales. The secret sauce was a combination of planning and collaboration among the sales team and a commitment to the sales and creative follow up strategies. Using the Sherpa CRM as a benchmarking tool, the Fox Hill team spent optimal time in the “selling zone”, proving that a sales focused on the prospect can have a huge impact on results.